Mr. DiSiena is extremely excited to be entering his 6th year teaching Computer Technology at Divine Wisdom Catholic Academy. 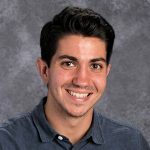 Mr. DiSiena has a BA in History & Secondary Education Social Studies from Queens College and an MA of Science: Curriculum Development and Instructional Technology Grades K-12 from SUNY Albany. Mr. DiSiena has received two certificates of completion from Educational Technology Professional Developments sponsored by Structured Learning and a certificate of completion from General Assembly focusing on Front End Web Design. Mr. DiSiena also teaches Theater and Improvisation to grades 6, 7, and 8. When Matthew is not teaching the wonderful students of Divine Wisdom Catholic Academy, he spends his time performing onstage, and pursuing hobbies which include hiking and listening to fun tunes in his automobile.